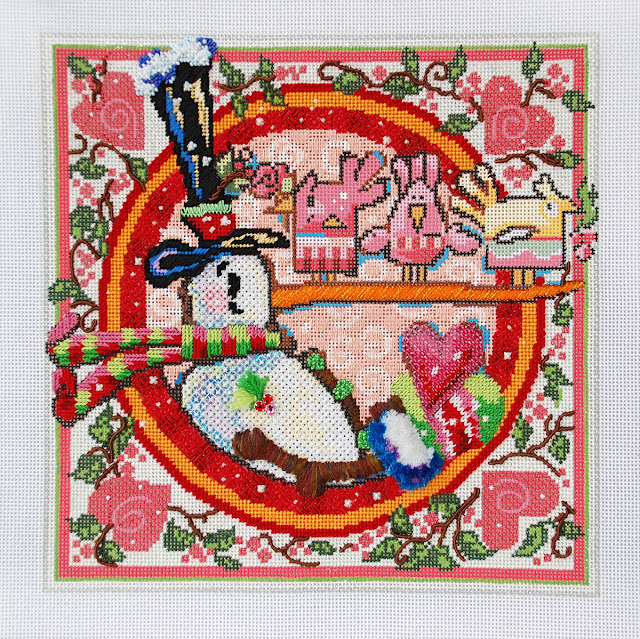 For those of you following the progress on our Snowman Mystery Class today is the third lesson. Kits are in the mail! More details are being developed on our snowman. Yay! This week, we focused primarily on his mittened hand holding the heart. We still have outlines to deal with. In many areas I am covering the upper black outlines and leaving the bottom ones exposed. This allows the lower outlines to act as shadows underneath the object. The heart is stitched in a combination of Basketweave Twill worked in Kreinik Fine (#8) Braid and 2mm Swarovski crystals. We stitched over the black outlines. Because the crystals are transparent a little of the black shows through creating shadows and depth on the edges of the heart. We could have used beads for the heart. I chose crystals for several reasons. One is that I have beads planned for elsewhere in the design (yes, I’ve tipped my hand.) I want contrast in texture between the crystal heart and other beads. The other reason I used crystals is that the heart is supposed to be really special. Tomorrow is Valentine’s Day after all. The mitten is again knitted, but the cuff is Turkey Work. I know, Turkey Work isn’t really anyone’s favorite stitch but it is a great effect. It adds drama to the design drawing your eye. The trick with Turkey Work is to use it only on areas that really need to POP forward and that don’t have anything interrupting the turkey work area as nothing else will ever be as bold of a stitch. On the snowman, the turkey work is perfect as his mittened hand needs to look as though it is projecting out of the circular frame toward us. Turkey Work trim on a santa where there are toys overlapping the trim doesn’t work as well. The turkey work trim will come forward and the toys will sink back and disappear. We also started the outer frame. It is filled with even more details. We want the frame to come forward in front of the snowman but the arm must still come forward the most. All of the brown vines are couched DMC memory thread. By the time you finish these vines you will be an expert at memory thread. DMC has a great tutorial on their website for how to attach the thread. You can see it here. It really is super easy to work with. Only two more lessons and our snowman will be complete! « Previous Mystery Post: A warm and snuggly scarf is needed on a cold wet snowy day! « Previous: Meet the Flirty Girls! glad everyone is enjoying the mystery. It's a fun way to stitch.